Once a week extra quickcleaning (floors and bathrooms) and change of bed linen FREE OF CHARGE from a stay of 2 weeks. We spent a long time trying to find the right villa for us to rent. It had to have a pool, near the beach and with Wi fi, you would not believe how difficult these 3 simple things are to find in 1 property. Luckily, we came across this stunning villa and could not believe the price - we quickly booked it up! Roland was very accommodating on dates, gave us very detailed instructions on the facilities available and had different rental packages. On arrival we were knocked out by just how beautiful the villa is. From the décor, the facilities, the pool, the gardens, the showers, the sunloungers - everything, and I mean EVERYTHING is of the highest quality. Ron (who does the handovers) was a really nice guy and gave a quick tour as well as a run through of do's and dont's (not needed as we had read our pack from Roland!!) and then even gave us a lift to the local shop to get some provisions. In reality it was only a 6 minute walk away. A really nice touch from Roland was a very large bottle of red wine waiting on arrival - much appreciated. All in all, a fantastic villa, truly stunning and I could not recommend it highly enough!! Everything is perfect, even for the smallest details and kind attention like the welcome pack. You are really living in your guest's home. Congratulations! We have recently returned from a week at this villa and I cannot recommend it enough. The villa was much larger than I anticipated and it has been finished to a very high standard. The bedrooms are big and there are two bathrooms to accommodate three bedrooms, there is also a separate bathroom behind the kitchen. The kitchen is very modern and looks almost brand new. There outside of the villa is superb, there is a great seating/dining area that is perfect for family meals and there is also soft seating to relax on. The pool is a good size and is immaculately clean. The whole villa was immaculately clean and tidy when we arrived and it really did surpass our expectations. We had a thorough tour of the villa when we arrived and we were shown how everything worked. The one standout thing for us was also how well the villa was equipped, it had absolutely everything you would find in your own home, there was nothing that we wanted that we could not find in the villa. 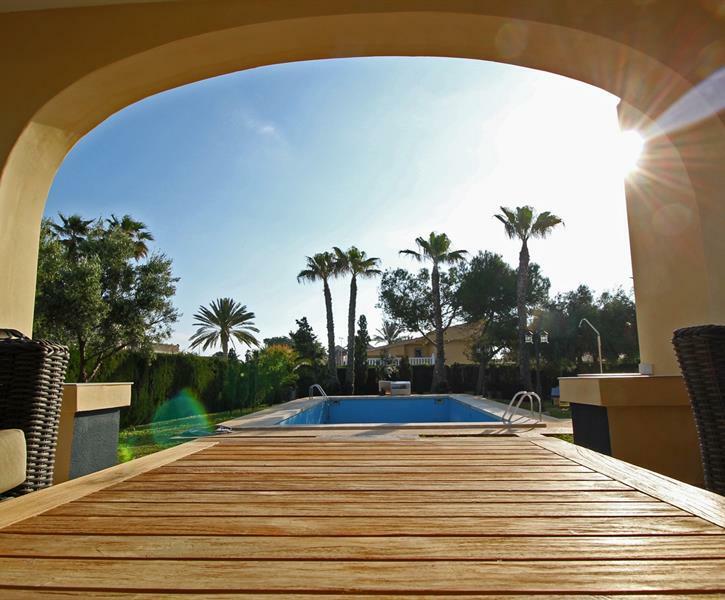 I would highly recommend this villa for a family holiday and we cannot wait to go back again.